The young pacer will not feature in the next two Test matches against the Aussies. Young South Africa pacer bowler Kagiso Rabada recorded exceptional figures of 11-150 in the second Test in Port Elizabeth on Monday and helped his side level the series 1-1. With the next two matches to be played on hard tracks of Cape Town and Johannesburg, Rabada would have been South Africa’s star performer and perhaps could have even led them to their first home series win over Australia since 1970. However, following the ban imposed on him, the paceman will be out of action in the last two games. 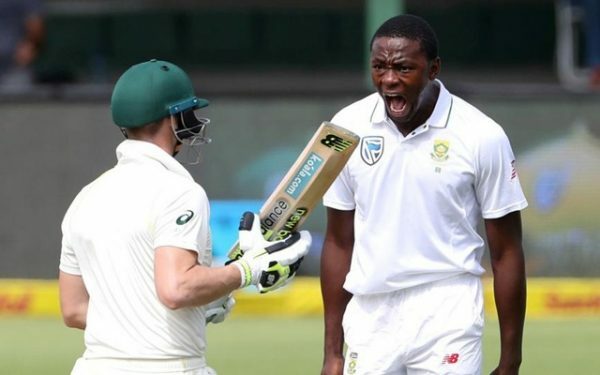 Rabada was found guilty of making a deliberate contact with the Australian captain Steve Smith. The sensational performer rushed shoulders with Smith after sending him back to the dugout. This took him to eight demerit points in a 24-month period, resulting in a two-Test ban. Commenting on the matter, former England cricketer Michael Vaughan seemed miffed with the decision to ban such a star performer, arguing that T20Is don’t see bans such often. “Test Cricket needs every star playing … I don’t see many being banned from T20 cricket … Such a shame Rabada is going to miss games … I guess Test Cricket is flying so it doesn’t matter !!!!!! !” the 43-year-old wrote. However, Rabada himself admitted having disappointed his team, saying that he will stop the misconduct hereon and learn from the mistake. “I have to move forward. I have to see it as a big learning curve and not repeat the same mistake. I am not happy about it but time moves on,” he told reporters on Monday. The hearing on Rabada’s offense was held after play on day three, while match referee Jeff Crowe gave the final verdict on Monday evening. As for South Africa, they might have just missed a golden chance to beat Australia at home after almost 5 decades.